Windows 7 introduced a profound reorganization of dynamic link libraries (DLLs). This restructuring effort is related with what is known as “Minwin” (Minimal Windows kernel) [WINNO]. Minwin is a complete reorganization of the Windows core components call graph so that lower level APIs never call higher level APIs. Consequently each API layer can evolve separately. This core components reorganization is undocumented except for some hints on the MSDN website [MSFT1]. It should be important to note that it is by no means important to programmers as it doesn't change the visible behavior of the Windows operating system. The problem is that, with this re-factoring, a single DLL might contain multiple logical sets of APIs. For example KernelBase will now contain different logical sets like registry handling, process and thread handling, memory handling, etc. Note: The following analysis has been made on Windows 8 Consumer Preview 32-bit. The same process roughly applies to Windows 7. The whole ApiSetSchema mechanism is based on a single file: "ApiSetSchema.dll" located in the \SystemRoot\system32 directory. The ApiSetSchema mechanism is activated very early in the boot process. The ApiSetSchema.dll file is loaded at boot time by winload.exe during winload!OslpLoadAllModules and winload!OsLoadImage alongside with very important images like the Windows kernel and the hardware abstraction layer (HAL). mov     [ebp+ApiSetSchemaUString.Buffer], offset aApisetschema_d ; "ApiSetSchema.dll"
+0x024 FullDllName      : _UNICODE_STRING "SystemRootsystem32ApiSetSchema.dll"
+0x02c BaseDllName      : _UNICODE_STRING "ApiSetSchema.dll"
Given the _LDR_DATA_TABLE_ENTRY structure that describes the "ApiSetSchema.dll" module, the code gets its image base and start parsing the in-memory file as a Portable Executable (PE) file. push    offset a_apiset ; ".apiset"
Note that we’ll explain later what the content of the memory view is. From now on, the section and its view are hold by the system. The last line of code above (at 0x006747F0) sets a view of the ApiSetMap in the PEB structure. As a reminder the PEB (Process Environment Block) is an internal Windows structure (there's only one PEB for a process) that is accessible by the process itself and its threads. This structure, which keeps many internals stuffs belonging to the process, lies in user-land and can be easily accessed without doing a system call (syscall). Windows uses a mechanism for redirecting virtual DLLs to logical (implementation) DLLs. At start up, Winload.exe loads the “apisetschema.dll” file. During Kernel initialization Phase 1, the “.apiset” file section from the DLL is mapped onto system kernel memory: A kernel object section and a view of this section are created. 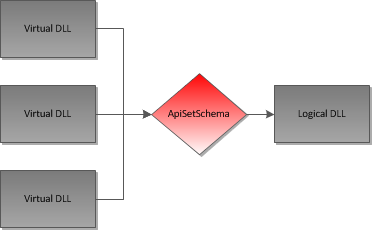 When a process is started, a view of the section is created into the process address and is available through the _PEB.ApisetMap field: the content of the “.apiset” file section from the “apisetschema.dll” file is therefore available into the process user space. In the next posts we'll see how the from what the ApiSetMap view is composed and how it is interpreted from user-land and kernel-land and how it can be used from static tools.